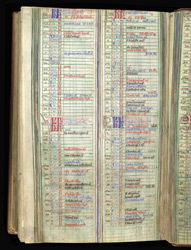 The last leaves of this manuscript contain a calendar, with four months per page. Each has a small sketch next to the blue or red 'KL' monogram to indicate the occupations of the month: a bird of prey for May, a sickle and wheat for July, etc. At 6 July and 12 July are recorded the deaths of two abbots of St. Albans: Ralph (1146-1151) and Simon (1167-1183).